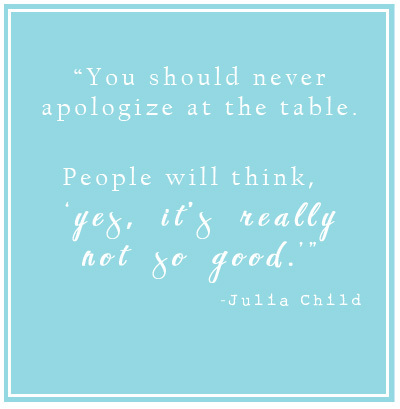 She (very kindly) pointed out that the idea behind this quote - never apologizing for who you are or any effort you've made - can be applied anywhere in life, not just the kitchen. Then she pointed out that I've been apologizing for everything lately, and that maybe I should just let that go. No one is perfect. ...ahem... It's not the first time someone has cared enough to remind me of this. It's true. I am very hard on myself and I do apologize a lot. I'm sorry my house wasn't spotless when you stopped by. I'm sorry I don't blog often enough. I'm sorry I burned the chicken. Again. I'm sorry I didn't mail the past two years' Christmas gifts. I'm sorry the pictures I took of that trip/town/festival aren't as good as I could have done. I'm sorry I haven't finished that project yet. Or that one. Or the other one. Or the one upstairs. I need to let go of that guilt and enjoy being bien dans ma peau, a French expression that means being at ease with oneself or comfortable in one's own skin. It implies knowing oneself, ones likes and dislikes, recognizing ones strengths and playing to them. And, simply, letting the rest go. Check yourself before saying the words "I'm sorry." Find another way to state your intentions or idea. If you've overcooked dinner, perhaps you can ignore it - my husband would likely never notice and I think he's a good example of the average male. 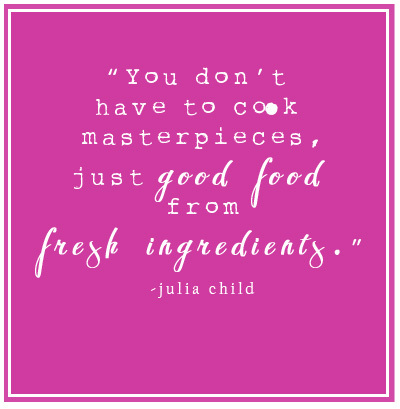 Focus on the positive: you made a thoughtful, home-cooked meal for your family. That took a lot of effort and time and love. If you made dinner perfectly, but it just isn't very good make a mental note that you simply don't like that recipe and let it float right out of your head. It's a learning experience, not worth dwelling on. On the other hand, we need to recognize when we should apologize. Perhaps we've said something unintentionally cruel or forgotten a friends birthday. An apology after a misstep is important and shouldn't be ignored. The key is to recognize what exactly we are apologizing for and to determine if an apology is the best means to remedy the situation. Bear in mind, too, that disagreements in personal policy don't require apologies. We shouldn't feel sorry for having values or morals or opinions, we just shouldn't be jerks when expressing ourselves. If you've done something that you feel has earned an apology, do that. But do yourself a favor and don't apologize for everything else, too. Acknowledge your mistake, make amends, and move on with your life. Every time you say or think something negative, follow it up with something positive. Maybe you didn't take stellar pictures of your nephew's birthday. Maybe you could have done better. Own that and try harder next time. But right now, feel good about doing something meaningful that day. Your sister wouldn't have had time to remember to take pictures and keep up with her hostess duties and you gave her an invaluable gift. Feel good about that. Be honest with yourself. What is your motivation for apologizing so much? Is it attention seeking? Are you looking for validation? Or do you really think nothing you do is good enough? I believe in the law of attraction and when we spend most of our time feeling bad about our efforts, we're just inviting in more of those same thoughts until our heads are so full of negativity that we can't see how awesome we really are. Stop taking on too much. I think most of us are guilty of over extending ourselves sometimes, but no one can do everything. And no one is good at everything. When we have too many commitments, it's easy to get overwhelmed and either do nothing at all or rush though our projects accomplishing the bare minimum - which, for perfectionists like myself, is a tough pill to swallow. It leaves us feeling guilty for doing so little on each project we've taken on. We want to present our best self, but we simply can't if we're always over scheduled. Take a moment to think about your special strengths and focus your energy on those gifts. Be kind to yourself. I'll bet you give most people plenty of leeway and probably never notice when they aren't perfect, don't you? Give yourself the same gift. And maybe a piece of chocolate. I'm busy at work putting these tips to work and some days it's exhausting, but it's getting easier. If negativity attracts negativity, then the opposite is also true. Positive thoughts bring their friends and make a party in your head until, before you know it, you're the happiest woman (or man) you know. What you do - it's enough. It's good; it might even be fantastic! Be brave. Enjoy it.